Our fireplace has been burning at all hours of the day and night these past several days. Following the abundant snowfall we received last week, we received an even greater abundance of freezing rain. 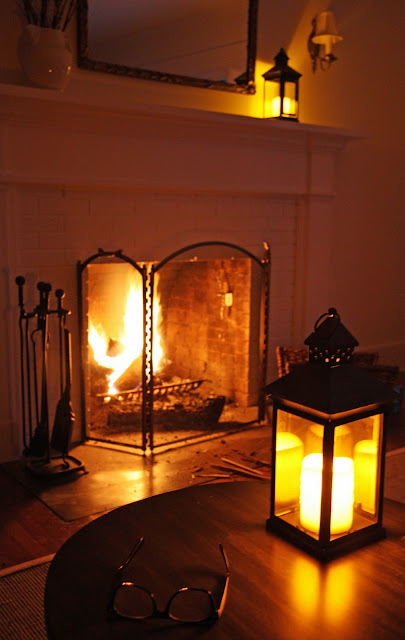 Many power outages followed, making the fireplace our main source of heat for a few days. warmth with its bright smiling flowers. Mike worked overtime splitting kindling and firewood. I stepped out onto the porch to snap this picture of our frozen landscape and the trees weighed down with heavy snow and ice. The oak and aspen trees fared the worst, with many broken limbs and downed trees. The sound of the limbs snapping and crashing to the ground was sad to hear. I wished there was something we could have done for them. The boxwood were completely coated with ice. Many of the other plants and trees looked the same. and early morning hours during the outages. The first morning light was always a welcome sight. When the power was on, we raided the freezer for warm meals that we could make quickly. One really appreciates a hot cup of tea or a warm dinner after being without for several hours. One delicious freezer treat all four of us enjoyed (babies loved it) was this cauliflower and kale soup Mike made a while back. The recipe is from Martha Stewart, which you can find here. Mike used twice the amount of kale that the recipe called for. It's very savory and delicious. 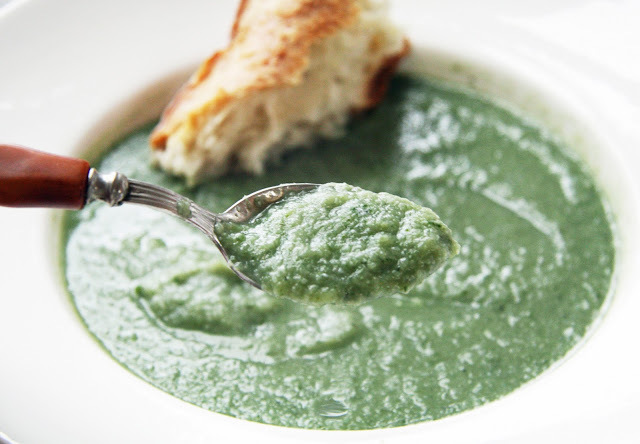 It reminds me of cream of artichoke soup. OMG!! Unbelievable photos. Stay safe and warm!! We are sweltering with the air con on all day its so hot 36 degrees at the moment. Australia day on thursday should be slightly cooler 31 degrees. We will have a cool glass of bubbly and think of you - no hot chocolate drinks here!! I live in New South Wales, Australia on the coast where it NEVER snows. Your images are just so beautiful & amazing to me - though I can imagine you don't have quite the same love for it when you are in the middle of power outages. 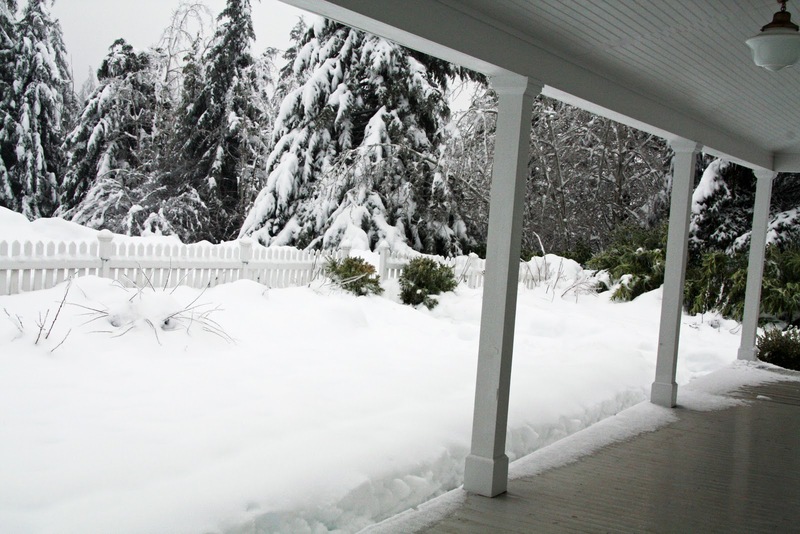 Thanks for sharing your photos and I hope you get some relief from all that snow soon! Isn't it amazing how something so beautiful can be so awful at the same time. I'm sorry about your trees - we lost some large limbs last spring during a horrible wind storm and you hate to see them damaged like that. Your photos are gorgeous though. Hunker down and stay warm! thats very icy looking outside your home- better stay inside! 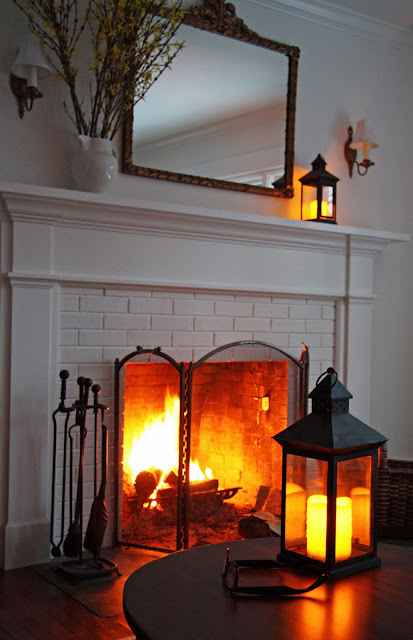 Open fire, lanterns, delicious soup...you make winter seem so inviting! Reading this I was actually wishing our Summer may end sooner rather than later, so we could light our own fireplace! Stay warm and I hope the power outages are very few and far between. Oh wow... I know what that is like to have no power and being so cold. That snow looks so deep! We don't get near that kind of snow here, in Texas, usually just ice. I do know how it feels to lose trees and not be able to do anything about it--we've lost trees because of ice and because of drought...it is heart breaking. Amazing photos of the surrounding landscape! every things is so beautiful and splended thanks for sharing your ideas. Sorry to hear trees were falling under the weight of the snow, but pleased you all stayed safe. The lanterns certainly look very cosy indoors. What I love most about your home is how it always looks like the perfect spot to weather any sort of storm. I am making that soup today! Looks warm and lovely. Hope your power is restored and that the ice has melted. The images are beautifully haunting. So adventurous! The soup sounds so yummy. Glad you are all safe and warm in your cozy home. You have more snow than your Canadian neighbours, I live in southern Ontario Canada and we have just a dusting of snow. The weather patterns are really strange this year. Stay safe Your photos are beautiful but this kind of weather can be dangerous. It does look so cozy inside your home. We had a horrendous ice storm our first winter in Kentucky a few years ago. We live on a meadow that is lined with huge pine trees and we could stand out on our screened in porch and hear the loud crack and thud as the heavy tree limbs fell to the ground - so many trees were lost in that storm. There definitely is an eerie beauty to all the ice coated trees, shrubs and hardscape. Being without power makes life interesting - it looks like you are coping well and there is satisfaction in having on hand what you need to be comfortable during times like this when the power is out and you are hesitant to venture out of your safe nest. Some way, even though I realize the unrest a ice storm and no power can bring, you seem to exude a calm and make everything possible and okay. . . warm, beautiful, cozy comfortable you make it seem. The iced boxwood photo certainly clarifies what the storm brought. I hope your power outtage is in the past and the tree damage is limited. Loved seeing the fire and candle light at night and then in the new morning light . . .
Beautiful photos. Glad you've made it through the storm okay. In fact, it looks like you thrived throughout it with your beautiful fire and candles glowing. Hope the worst it over and you can get back to normal. 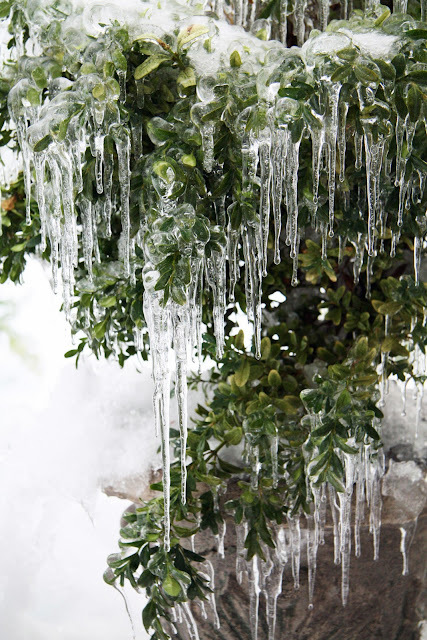 The boxwood with icicles is beautiful! Looks like a great soup recipe, I think I will make this tonight. I live in Calgary Alberta Canada. We can get the heavy snowfalls here sometimes, it is sad to hear branches snapping. All the snow looks beautiful though. I've just read your last several posts...Not sure how I missed them....the snow, the first tracks with the babies in the sled and now seeing the fire in your beautiful fireplace....it's making me miss snow....but only the snow and ice storms with the power on! That soup looks very warming. I hate it when we loose limbs or trees split because of the heavy snow. We call our house little house on the prairie because we loose power if you sneeze too loud. Know the feeling and we love and appreciate our fireplace because of that. Hang in there! We have well water too so when we loose power we loose water. I hate it. We lost power at Windy Ridge, too. Fun for a few hours, but after 12 hours I was ready to have it back! It's not easy living out in the country and have a winter storm! We live in an old farmhouse too that we're restoring. It needs new windows (new everything really!) and wasn't made with insulation in the walls. Last winter when we had the blizzard my husband got called out to work the storm. We don't have heat in the upstairs, the stove had just broken down, and we'd ran out of firewood. It made for a very cold week for the boys and I! Glad to see your hubby there and that you have firewood to help keep you and the little ones warm! Ice is no fun. Beautiful pictures. Oh no! An ice storm is the worse! But you look like you came thru just fine like any country woman would. What did the babies think of all the lanterns? Me gusta mucho tu forma de vivir. Thanks for sharing Martha's recipe, haven't tried kayle yet?? Sounds cozy:). Outages are fun..... as long as they don't last too long:). I hope the babies enjoyed the adventure;). It looks very isolated. But beautiful! I bet the wood cutter wishes you had a slow combustion stove/wood burner and the cook wishes it had a hotplate on top! Can you get them there? Old country farmhouses all over Australia used to have AGAs. I so wanted one in my house and searched, but we have such a short mild winter it would rarely get used. Oh my goodness! The first thing I thought of was your hydrangeas. Hope they're okay! And, how kind of you to post a story though you've been in and out of power. Hope all is well, at least it looks warm and cozy! Hope things are up and running again now. Even in the winterstorms you`re blog is the most beautiful and inspiring to visit. Hope the winter gets a little better for you, and that the winterstorms are over. Keeping my fingers crossed you have lovely winter weather from here on out! Nice and inspiring blog on many, many levels. Your picture gave me the chill. Sure doesn't help that it's been minus 35 degree celsius outside for the best part of the last two weeks. How awful, I really feel for you. This happened to us on October 31st/November 1st. Our property and town looked like a war zone. Finally after 30 hrs. we had our power back, my siblings weren't so lucky. They were out between 5 & 7 days. I hope you don't have too much damage. Love your blog! I hope you get your power back soon. The snow pictures are so beautiful. 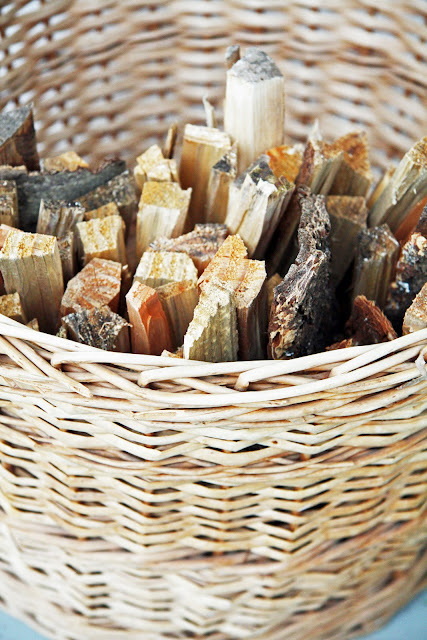 Thank goodness for the fireplace and all the chopped wood ! I just found your blog and love it here - I am so happy to stumble across you! I will be back. Have a wonderful weekend! Snow is lovely til the power goes out! Hope everything is up and running now. At least you are all snug and safe in your cosy home. I've just started following your blog, - you have a beautiful family and home. A truly inspiring place to visit. 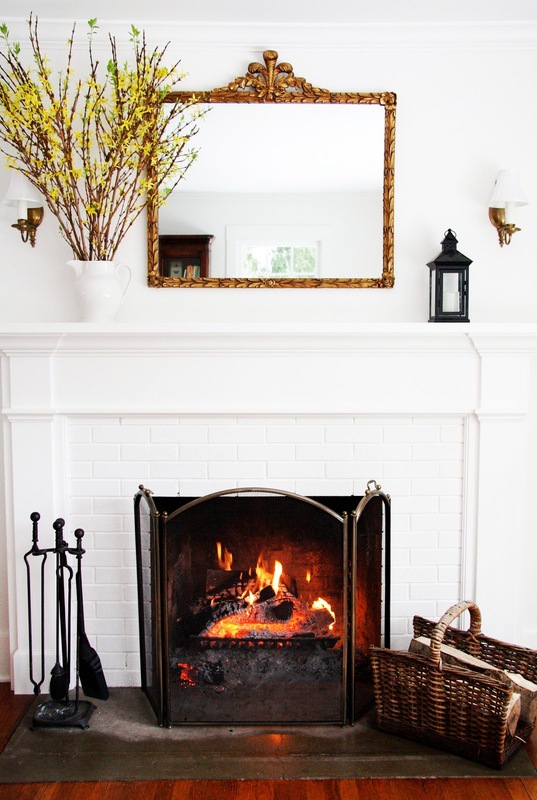 How cozy and welcoming your fireplace (and your home!) are in weather like that. So sad about your trees, though. Always breaks my heart to lose a tree. Now I have to ask about the soup, when you say 'from the freezer' do you mean you had the ingredients frozen or the soup was made previously and frozen. I've been making all kinds of soup this winter, butternut squash, creamy chicken, minestrone and would love to stock up my freezer! Take Care. We froze the soup. It freezes really well due to its pureed texture. We eat a lot of soups too and try to make a double batches to freeze for leftovers. I cannot imagine living amongst that snow..do the plants recover?? I would love to live in snowy climbs, I do love the cooler weather. I think when we had this happen in the UK it was a wake up call that we needed the help of any electricians in Cambridge to put in a back up supply - we now have a generator which is (fairly safe) and does the job when we need it to. I would definitely give it some thought if you think you will have to endure repeat winters/power loss. The snow is so beautiful! We have so missed it in this very mild Connecticut winter. Nothing like a warm fire and a steaming bowl of soup on a cold winter's day! Hope all is well.